If you love a good adventure, then this list of TV shows like the Shannara Chronicles is going to leave you wanting for the open road, adventure and perhaps a little bit of magic. This show is a full on fantasy adventure that makes me want to have magical powers of mine own. Sometimes I wish I could just escape and be some kind of magical apprentice for a while, same? I would totally wear all the fun outfits and have some magical fire to throw, hopefully in a glowing blue color. That’s not too much to ask right? I have it all planned out, and I might just make myself royalty or something. If you are looking to escape into a sci-fi fantasy adventure, cuddle up on the couch with Bae and check out these TV shows just like The Shannara Chronicles! The Shannara Chronicles is a fantasy drama television series that premiered on MTV on January 5, 2016. Season 1 concluded on March 1, 2016. 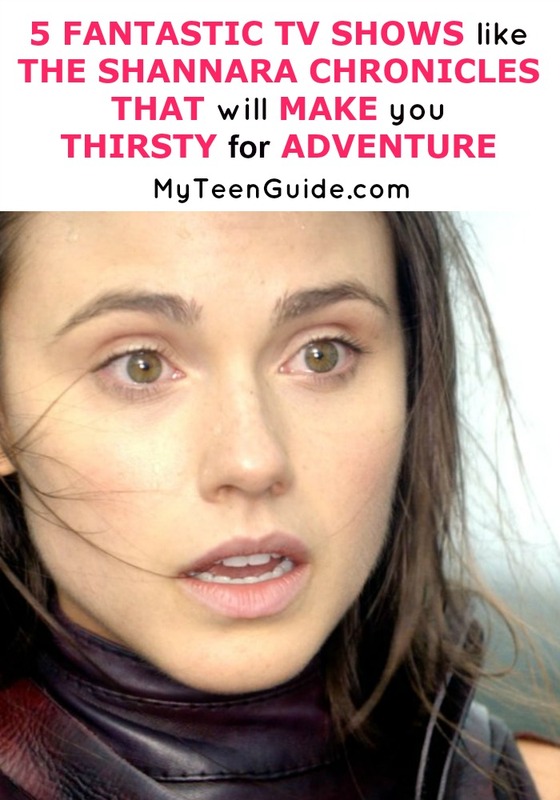 It is adapted from the 1982 book The Elfstones of Shannara by Terry Brooks. The series takes place in the Four Lands and showcases the war, evil and adventure that occurs. The Shannara Chronicles stars Austin Butler as Wil Ohmsford, Poppy Drayton as Amberele Elessedil, Ivana Baquero as Eretria, Manu Bennett as Allanon and Aaron Jakeubenko as Ander Elessedil. Here are some other excellent TV shows you are going to want to watch like The Shannara Chronicles. Shadowhunters is a fantasy television series that premiered on Freeform on January 12, 2016. The first season concluded on April 5, 2016. It is based on the book series The Mortal Instruments by Cassandra Clare. The series focuses on Clary Fray, a teenager who discovers she is a Shadowhunter, human with angelic blood. Shadowhunters stars Katherine McNamara as Clary Fray. The Magicians is a fantasy television series that premiered on Syfy on December 16, 2015. Season 1 concluded on April 11, 2016. It is based on the 2009 book of the same name by Lev Grossman. The series showcases the life of Quentin Coldwater, who enrolls in school to be trained as a magician. However, he soon figures out that the magical world is indeed real and a threat to mankind. The Magicians stars Jason Ralph as Quentin Coldwater. Into the Badlands is an action drama television series that premiered on AMC on November 15, 2015. The first season concluded on december 20, 2015. The series tell the story of a young boy and a warrior who are on a journey to seek enlightenment, traveling through some dangerous land. Into the Badlands stars Daniel Wu as Sunny and Aramis Knight as M.K. Legend of the Seeker is a fantasy supernatural adventure television series that aired for two seasons on ABC from November 1, 2008, to May 22, 2010. It is based on the book series The Sword of Truth by Terry Goodkind. The series follows the journey of four people, including The Seeker of the Truth, The Mother Confessor, The First Wizard and The Mord-Sith, as they defend their people against evil. Legend of the Seeker stars Craig Horner, Bridget Regan, Bruce Spence and Tabrett Bethell. Heroes is a sci-fi drama television series that aired for four seasons on NBC from September 25, 2006, to February 8, 2010. The series follows the lives of everyday humans who have superhuman abilities. Heroes stars Hayden Panettiere as Claire Bennet, Milo Ventimiglia as Peter Petrelli, Adrian Pasdar as Nathan Petrelli, Masi Oka as Hiro Nakamura and Greg Grunberg as Matt Parkman. So do you know of any other TV Shows Like the Shannara Chronicles that should be on my list? Are you a fan of any of these series? Would you take on magical powers that let you throw blue fire too? Tell me in the comments!